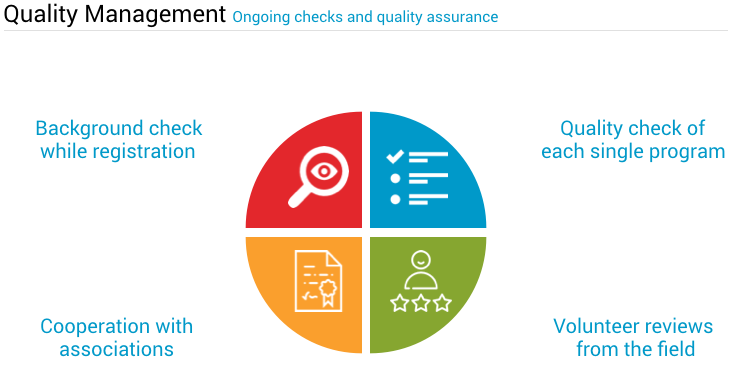 Quality Management is a very important part of our daily work as we want to make sure that every project that is registered on our website fulfills our high platform standards and is a trustworthy and reliable partner. To achieve this, we developed a four-step process that guarantees the ongoing high quality of social projects. Before a social project is allowed to join our platform, we conduct an extensive research about its social impact and the experiences of former volunteers. At the same time, we also check existing blacklists of volunteer organizations that are under suspicion of abusive behavior. If a social project passes the first step, we inspect every single volunteer program and pay a special attention to their ethical standards. Only the volunteer programs that match our ethical standards will be published on our website and thus made accessible for volunteers. To ensure our platform ethics and to be able to react to recent developments, we work closely with various organizations for animal welfare or child advocacy. This helps us to achieve an ongoing assurance that the projects we feature satisfy global ethical standards. Only organizations that comply with our high ethical standards regarding e.g. the work with children and animals are listed on Volunteer World. Our approach has received multiple awards and is one reason why we are listed on rank 10 of the SE100 - an index that indicates the most innovative social enterprises in the world. We highly value experiences from former volunteers which they made when working with the social project. We ask them to give us a detailed review of their stay. This is to ensure that all the before-mentioned ethical standards are actually put into action. On top of that, the reviews provide a great help for potential volunteers to decide whether or not they want to join a specific social project. Volunteer World is the very first platform for international volunteering that works in accordance to the Sustainable Development Goals (SDGs). The SDGs are used on Volunteer World to show the pursued goals of each listed program which ensures a transparent and sustainable social impact of the volunteering programs. The SDGs also enable volunteers to decide which goals they want to contribute to during their meaningful journey. 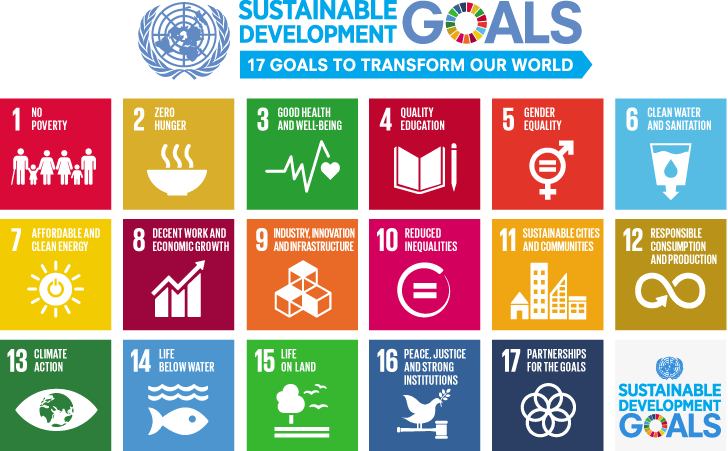 These 17 Goals build on the successes of the Millennium Development Goals while including new areas such as climate change, economic inequality, innovation, sustainable consumption, peace and justice, among other priorities. The goals are interconnected – to reach a success in one goal will often involve tackling issues that are more commonly associated with another one.